On the evening of June 24th, 2012, I had the pleasure to interview Alexander Skepp and Gabriel Tapper, respectively drummer and bassist of Swedish outfit Gösta Berlings Saga, whose career-defining performance on the morning of the same day – the closing day of the festival – wowed the audience and earned them many new fans. While their bandmates, guitarist Einar Baldursson and keyboardist David Lundberg (who is also a member of Änglagård), remained downstairs to man the band’s vendor table, Gabriel and Alexander kindly answered my questions while sitting at an outside table on the Zoellner Arts Center’s third floor. As it was my first attempt at a video interview, I apologize to my readers if the quality of the final product is not stellar. However, I hope the content of the interview will make up for any technical shortcomings. Hailing from the Swedish town of Vällingby, on the outskirts of Stockholm, and named after one of the masterpieces of their home country’s literature – a Gothic romance about a defrocked priest written in 1891 by Nobel Prize winner Selma Lagerlöf – Gösta Berlings Saga are quite different from the stereotypical retro/symphonic-oriented Scandinavian prog band. Their debut album, Tid Är Ljud, was released in 2006, two years after the band’s formation; however, it took their sophomore effort, 2009’s Detta Här Hänt, to put them on the map of the international prog community, garnering very positive critical attention. Glue Works, the band’s first album for Cuneiform Records , came out a couple of months after the cancellation of the 2011 edition of NEARfest, which would have been Gösta Berlings Saga’s first appearance outside Europe – an appointment that has only been delayed, as the band’s inclusion in the lineup of NEARfest’s final edition (scheduled for June 2012) was announced at the end of October. 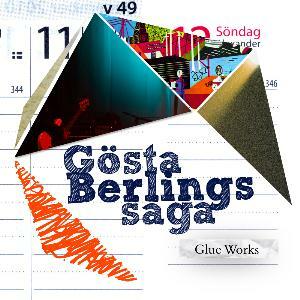 Produced by Änglagård/White Willow drummer Mattias Olsson, Glue Works (the first Gösta Berlings Saga album to bear an English title) stands out even in a year characterized by a glut of impressive prog releases. Like the band’s previous releases, it is a completely instrumental effort, comprising 7 tracks running between 2 and 12 minutes, and, at a mere 46 minutes, shorter than either of its predecessors. Even a cursory listen to the album will make it clear that Gösta Berlings Saga do not need to fill a CD to capacity to convey their musical message, which hinges on cohesion, intensity and mood-building rather than copious amounts of padding. Though their sound displays an unmistakable Northern European imprint – blending mellowness and angularity with subtle brushstrokes – and the presence of Mattias Olsson anchors the album to the Scandinavian prog “renaissance” of the early Nineties, some distinctly modern features lurk beneath those Mellotron washes. On a scene where, in spite of the “progressive” name, true originality is very often at a premium, Gösta Berlings Saga’s approach, while not forsaking the complexity that is synonymous with progressive rock, also relies on other factors to make an impact. Rather than hitting the listeners over the head with mind-boggling time signature changes and flashy solo spots, they balance the sheer emotional intensity of their compositions with a remarkably disciplined texture, where each instrument contributes to the whole instead of striving for the spotlight. With a classic configuration of guitar, bass, drums and keyboards augmented by cello, horns and some not so usual presences such as the musical saw and other assorted effects, the band produce an impressive volume of sound while keeping a tight rein on any temptation to overreach themselves. Opener “354” develops from a main theme repeated in a tense, almost obsessive fashion, intensified by the piercing tone of Einar Baldursson’s guitar and David Lundberg’s sparse electric piano, building up to a climax whose hauntingly cinematic quality is emphasized by the eerie sound of the musical saw. Alexander Skepp’s forceful drumming, coupled with Gabriel Hermansson’s growling bass lines, propels the composition forward with a mesmerizing precision reminiscent of Univers Zéro’s Daniel Denis. This imperious, faintly menacing mood is reprised by the much shorter, but equally hard-hitting “Icosahedron”, whose wistful, autumnal-sounding piano bookends are offset by a jagged, slightly dissonant guitar solo. It is with “Island”, however, that Glue Works really comes into its own. This towering, 12-minute wild ride – epic in the true sense of the word – packs a punch that is both emotional and intellectual, its relentless, wave-like surge reminiscent of post-rock/post-metal bands like Pelican or Ulver. The track opens with the steady, mournful drone of Cecilia Linné’s cello, bringing to mind Anekdoten and creating that subdued, intimate mood so typical of “chamber rock”. Then lilting piano and keen-edged guitar add their voices to the heady instrumental stew, driven along by the commanding pace of the drums; the final section blends abrasive sounds with warmer, organic ones in an exhilarating climax. After such unadulterated intensity, the sparse, atmospheric texture of “Gliese 581g” (the name of a small planet in the constellation of the Libra) almost feels like a welcome respite; however, the track’s second half develops in a completely different direction, strongly rhythmic with razor-sharp guitar slashes. Two short tracks, the atmospheric, synth-driven “Waves” with its solemn, almost tribal beat, and the tense, ominous “Geosignal” introduce the album’s final and longest number, “Sorterargatan 1” (named after a street in the band’s home town of Vällingby, and reprising a track featured on Detta Här Hänt). Though not as viscerally intense as “Island”, it is a dramatic slice of Crimsonian angularity interspersed with the imposing, martial stride of Magma, the powerful surge of the drums and bass bolstering the lead guitar’s unbridled exertions – until, all of a sudden, everything subsides, leaving the stage to sparse piano and gently chiming glockenspiel, later fleshed out by the addition of cello and horns in a poignant, melancholy-drenched coda. With its minimalistic packaging and boldly eclectic approach, Glue Works manages to sound thoroughly modern without rejecting the influence of the “founding fathers” of prog. Indeed, it successfully marries the no-holds-barred intensity of King Crimson, Van Der Graaf Generator and Univers Zéro with the entrancing, layered textures of post-rock, achieving a nearly perfect mix of melody, atmospherics and aggression. Challenging without being inaccessible, impeccably executed yet devoid of self-indulgence, Glue Works is a must-listen for lovers of instrumental prog, and highly recommended to everyone else. Gösta Berlings Saga have established themselves as one of the bands to watch in this second decade of the 21st century, and their performance at NEARfest 2012 promises to be memorable.